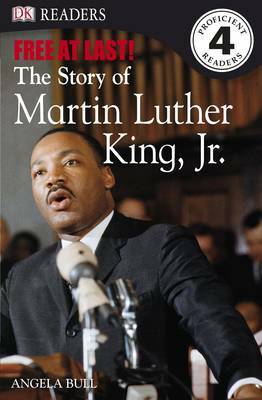 "DK Readers" will help your child learn to read and encourage a life-long love of reading while they learn about the life of Martin Luther King. Encourage your child to read. They will learn about the life of slain civil rights leader Martin Luther King Jr., who encouraged non-violent protest to fulfil his dream of a world where people would be judged by 'the content of their character, not by the colour of their skin'. "DK Readers" are part of a five-level highly pictorial reading scheme, which uses lively illustrations and engaging stories to encourage reading. Level 4 have rich vocabulary and challenging sentence structure, additional information, alphabetical glossary and index to help challenge growing readers and build literacy skills. Read them together with children who are reading alone and with reluctant readers.